WERC's September Graduates Find Employment! 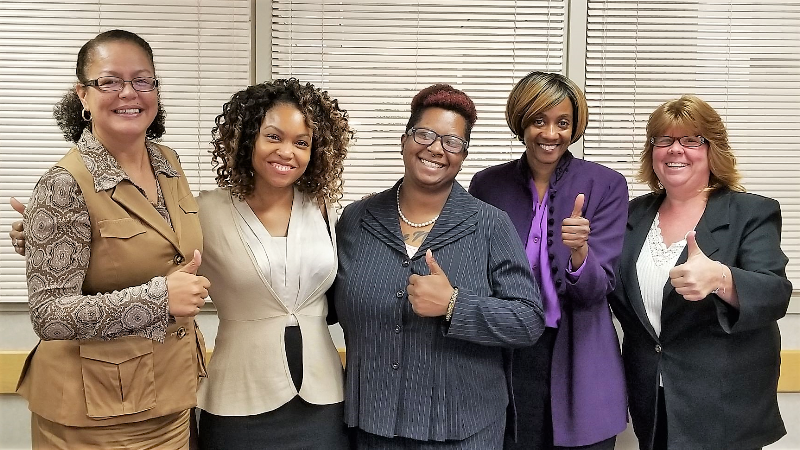 WERC’s September 2018 graduates, Lynette, Sha-Netta, and Taknika, have not only completed the WERC Training program, they have all successfully re-entered the workforce within a matter of weeks after graduating. These three individuals have managed to accomplish their goals despite adversity. They all faced challenges as Displaced Homemakers, such as losing their jobs and having difficulty finding jobs to pay their bills. They struggled with finding ways to re-enter the workforce, until they found out about the resources that WERC provided. With the same goals in mind, these women registered for WERC’s Customer Service Training Program. Through this program they were able to gain the skills and confidence needed to find great jobs. Lynette was recently hired as a Receptionist at Parkside Veterinary Hospital. Sha-Netta, who was the Student Speaker at our 30th Anniversary Awards Celebration, so impressed attendees from Alaant Workforce Solutions in Albany with her speech that Sha-Netta was hired as Alaant’s Resource Manager. Taknika also recently started her position as Human Resources Generalist at St. Catherine’s Center for Children in Albany. Other graduates of the September class, Jennifer and Arna, have had multiple interviews recently and prospects for employment are looking very positive. We would like to congratulate all of our graduates on their success and commend them on their strength and accomplishments. Photo: (left to right): Lynette, Sha-Netta, Taknika, Jennifer and Arna.